The Hebrides are a group, or chain of islands off the Western Coast of Scotland. They’re quiet, remote, windblown and utterly beautiful. You’ll see turquoise waters that will make you want to kitesurf on them forever! The Inner Hebrides is the chain of islands closest to the mainland. They comprise 35 inhabited islands as well as 44 uninhabited islands (with an area greater than 30 hectares). The Outer Hebrides is the chain of islands farthest from the mainland. They’re sometimes referred to as the Western Isles. There are 15 inhabited islands and more than 50 substantial uninhabited islands. Like much of the UK, the Hebridean climate is described as being a mild oceanic climate. Temperatures are generally cool. The Inner Hebrides is surprisingly sunny, with Tiree being one of the sunniest places in the UK. It can be wet, so if you’re planning a visit, May to August are typically the driest months. The Hebrides are windy…. VERY windy! Some areas experience gales one day in every six. In the winter months small fish have been blown onto the grass on top of 190 metre high cliffs at Barra Head during winter storms! The good news if you’re planning a trip is that you’ll almost definitely see some wind. Sadly we still haven’t made a trip to the Hebrides, but having spent some time researching, we’re thinking of going VERY soon! All of our data has been kindly supplied by fellow kitesurfers. 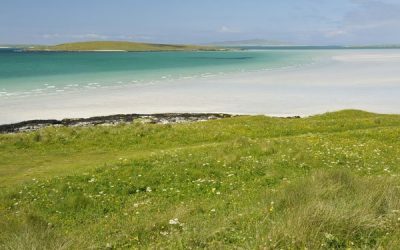 If you’d like to tell us about your favourite spot in the Hebrides, please get in touch. Like many Hebridean beaches, Traigh Lingeigh features white sand and crystal clear water. It’s a shallow beach, and protected from the waves, making the ideal freestyle wakestyle venue. Uig Bay features a large stretch of sand with the sea coming in from the north west. At high tide the bay fills with crystal clear water around 2ft deep. 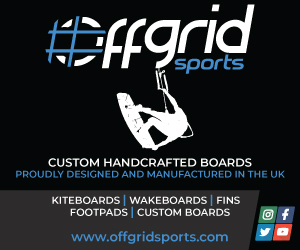 The perfect spot for learning or performing freestyle / wakestyle tricks.